The one car the Porsche Taycan really needs to give a bloody nose is the Tesla Model S. The pokier versions of the Model S have a reputation for being absurdly quick - faster not only than conventional petrol-powered rivals but considerably more expensive supercars too. 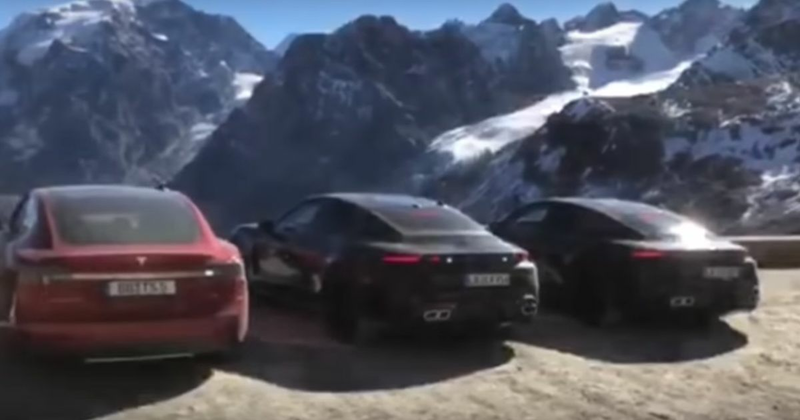 It should come as no surprise, then, that two Taycan test mules have been spotted undergoing what looks to be a benchmarking test against a Model S on the oh-so twisty Stelvio pass. The derivative used in the video above - the quality of which is positively potato-spec - is a P85D, a curious choice given that it’s a discontinued model. It produces 682bhp from two electric motors and an 85kW battery, making 0-62mph possible in 3.1 seconds. We don’t have firm figures for the Taycan yet, although Porsche has said its first-ever EV will develop over 600bhp and do 0-62mph in less than 3.5 seconds. 0-124mph, meanwhile, will be sorted in under 12. It’ll go into production in 2019, and be followed by a production version of the Mission E-Cross, which was confirmed by Porsche last week.